Red Bull team principal Christian Horner says the driver market in 2018 has been slowed down by Mercedes' inability to secure Lewis Hamilton's future. The world champion's contract runs until the end of this season and he is yet to commit to a new one, despite insisting he will. Daniel Ricciardo is also yet to sign fresh terms with Red Bull, although the Australian is widely expected to commit to his current employers before the mid-season break. Ahead of the Austrian Grand Prix, only Max Verstappen and Sebastian Vettel among the big three teams' drivers are contracted for 2019, with Kimi Raikkonen and Valtteri Bottas also unsure of their futures. 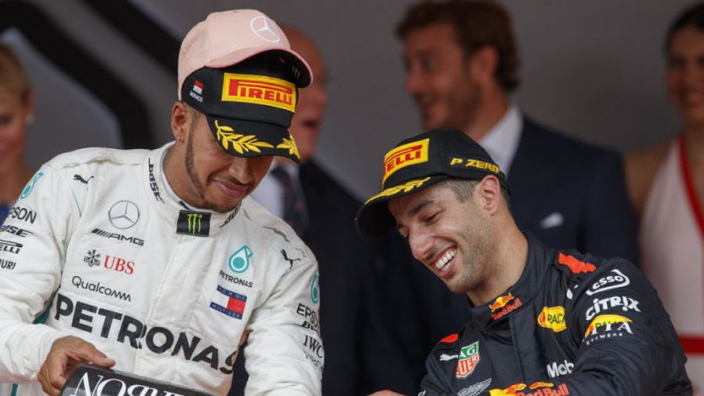 Sat next to Mercedes chief Toto Wolff in Friday's press conference, Horner suggested that the Silver Arrows managing to get Hamilton to sign on would be key when discussing the future of Carlos Sainz Jr - Red Bull's driver on loan at Renault in 2018. "All of these things are interlinked in some way, shape or form," said Horner. "I think the whole driver market is waiting for Toto's driver to kick that off. "I'm hoping Silverstone you're going to finally get your finger out and sign a contract. He's worth every penny! "As soon as Toto signs his contract, or two contracts, that then will cascade, and Carlos Sainz will be a mechanism within that. It's all down to Toto, really." Pushed specifically on Sainz, Horner added: "Renault have a desire to keep Carlos. It really depends whether we have a requirement for him or not. Our intention is to retain both drivers so once that’s clear then we will sit down with Carlos." Ricciardo said on Thursday that he wants to finalise negotiations before the mid-season break - a deadline Horner expects to stick to. "Things are progressing well with Daniel. I think things will be concluded prior to the summer break," he said. "Our priority has been firstly to get the engine situation sorted, and now things are progressing with Daniel. "I'm sure in the next couple of weeks hopefully we'll be entering the finishing straight to get things concluded prior to the summer break."